Black printmakers have a long history in the South African art world. Many of South Africa's top black artists, both past and present are also work in print. These established artists are survivors of the dysfunctional society that existed during the apartheid era and are a constant source of inspiration to a younger generation of South African artists. There are a few black printmakers who worked almost exclusively in print. Among these are the late John Muafangejo (a Namibian artist), Dan Rakgoathe and Cyprian Shilakoe. All three artists played a valuable role in establishing a sound base for future generations to work on and their work is highly collectable. All three studied at the Rorke's Drift community art centre, which played a critical role in developing artists. Phillipa Hobbs and Elizabeth Rankin wrote a book titled "Rorke's Drift EMPOWERING PRINTS" about the evangelical Lutheran Art and Craft centre at Rorke's Drift. It is an excellent book and is well illustrated and full of information. To quote from the book: "Amongst the many subjects taught, printmaking was the strongest area of production, in part because of its particular potential to carry socio-political messages. Sam Nhlengethwa, Dumisani Mabaso and Tony Nkotsi all studied there. 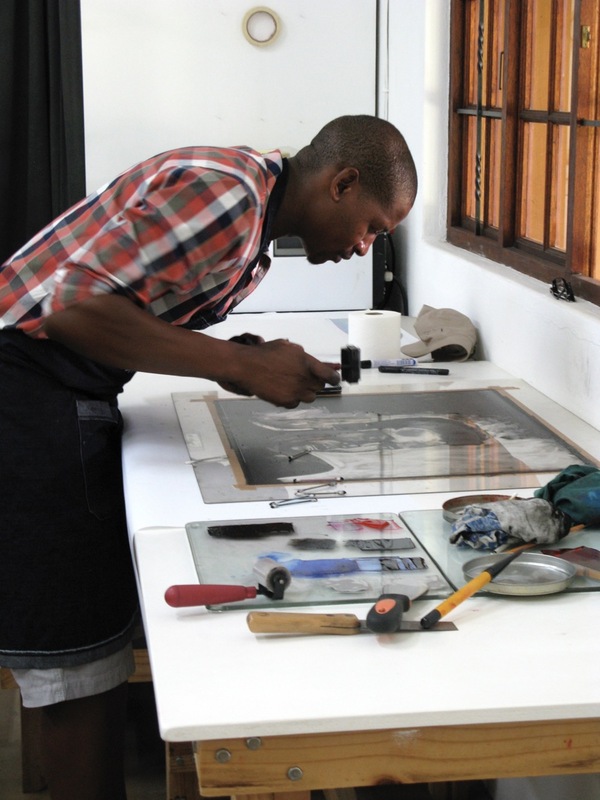 The studio which has probably trained more black printmakers than anywhere else in South Africa is the Artist Proof Studio. 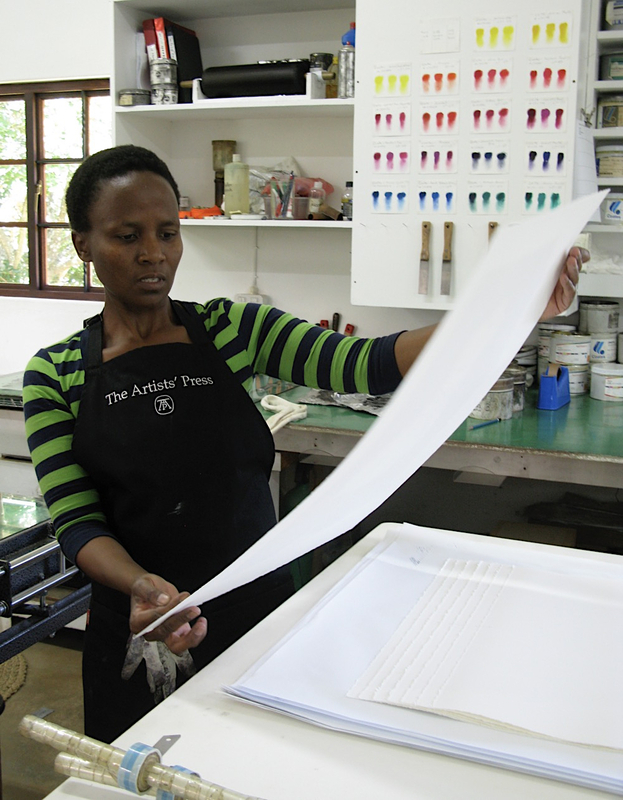 The Artist Proof Studio is a community printmaking centre in Newtown, Johannesburg. The work produced at the studio tends to have a strong social message and is a way for the young artists there to explore issues of culture, tradition, politics and change. They also publish work and have a professional shop that works with some of South Africa's leading artists. A number of people trained at The Artist Proof Studio have gone on to establish their own workshops or to work for other print workshops. Nhlanhla Xaba was instrumental in establishing the Artist Proof Studio and until his tragic death in a fire that gutted the studio was producing some of the finest prints made in the country. There are a number of print studios in South Africa. It is best to do an internet search to see who is currently running a studio. Establishing a print studio is an expensive exercise and equipment is hard to come by in South Africa as are materials of a high enough standard; much has to be imported and so the barriers to establishing oneself as a printmaker are high. Charles Kholobeng from the Artist Proof Studio during a workshop at The Artists' Press. Pontsho Sikhosana from the Artist Proof Studio during a workshop at The Artists' Press.